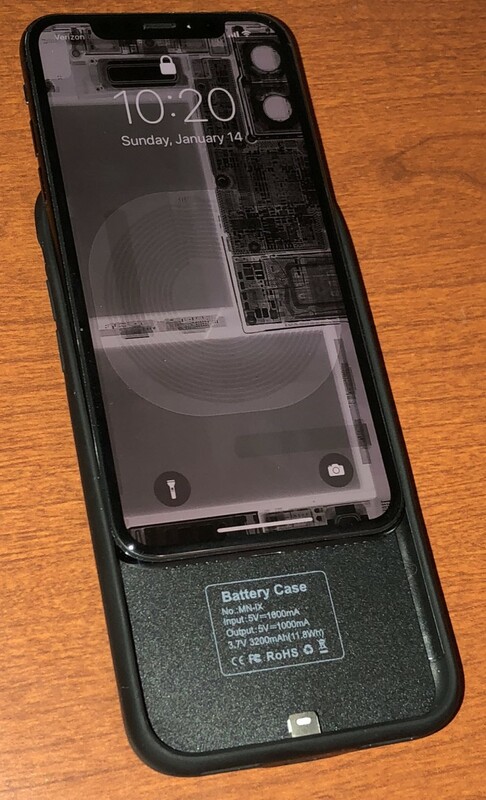 Credit for the above iPhone X-ray image with Qi charging coil goes to iFixit, and it's available for download in full-resolution for use as lock screen wallpaper! Disclosure: This article contains affiliate links, details in the Affiliate Link Disclosure below every page. 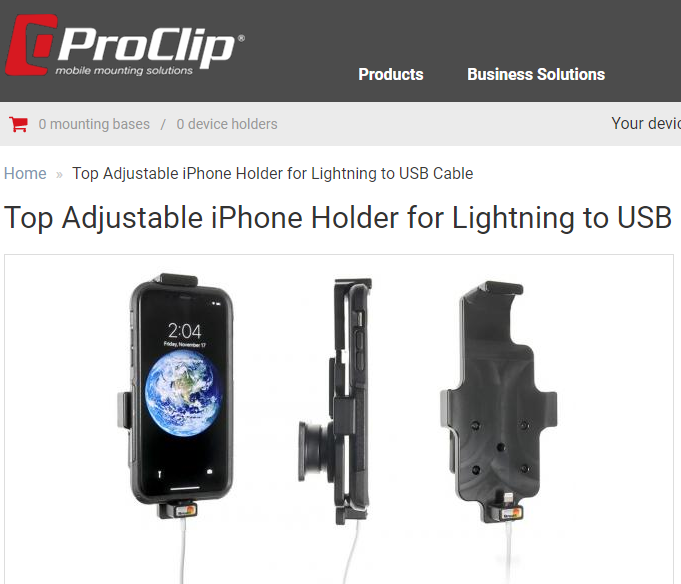 Many of these items will work with Android phones just fine. For me, my experience has been mostly with iPhones, since the iPhone 3GS arrived back in 2009. Even then, I immediately invested in a cradle base for my car, replacing just the cradles as needed ever since. I've been enjoying my iPhone X since it arrived in November, and it's been a better experience than all my other every-other-year upgrades. Little things like widespread online availability of Apple's leather case made the even the initial experience easier, as did having a USB-C to Lightning cable on hand for extremely fast charging with certain power supplies. It charges fast from my Dell Precision 5520's USB-C port, offering a secure wired Personal Hotspot and high speed charging. Perfect for my business travel, especially in airports! This combo is something I've been wanting for about a decade now. There was a bit of a learning curve when learning the home-buttonless design. 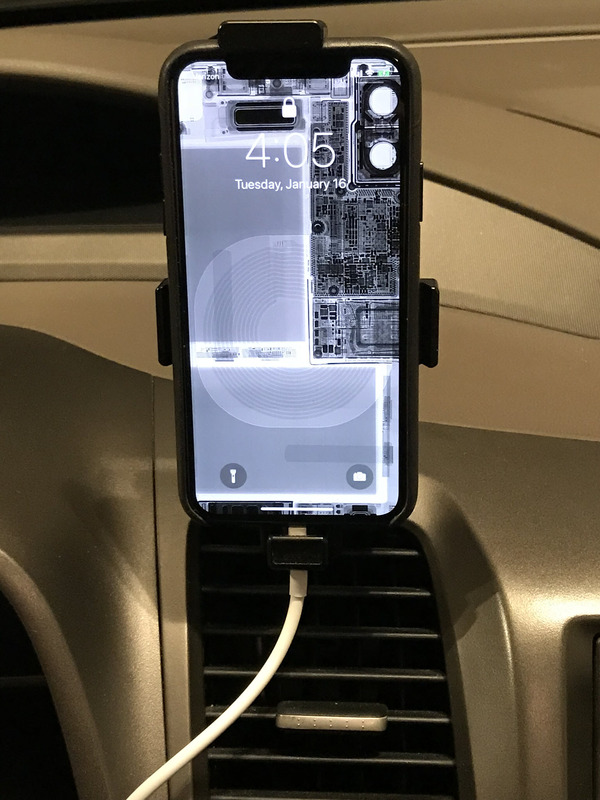 Face ID and swiping to get to my home screen took a few minutes to (mostly) get used to. After just a couple of hours, going back to my iPhone 7 Plus for even a few moments felt awkward, and it appeared ancient, with that big chin. I already forgot to hit the home button instead of swiping up. All that said, I knew my iPhone X was a keeper. Quickly. I also knew this new iPhone would require some new accessories, greatly enhancing my ownership experience. Qi was a big new thing for me, and fast charging is such a joy. I do a fair amount of driving around alone, for my job. I'd say it's a 90/10 split between listening to podcasts versus Spotify and conference calls. So having easy access to these functions continues to be of utmost importance, and I like the full quality audio that the wired experience offers me in a car. I also listen to podcasts. A lot of podcasts. And the sound quality of the built-in speakers blaring from my pocket is still rather tinny compared to a decent set of speakers. 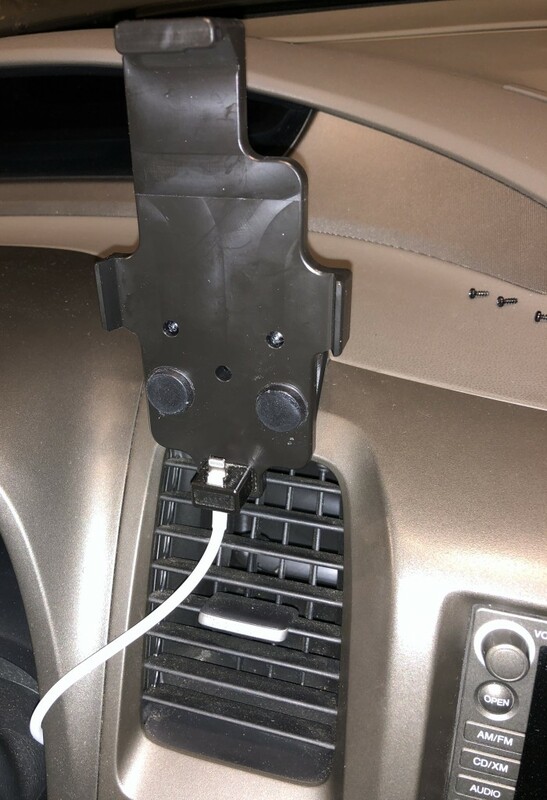 I have my car all wired up with great quality sound, but what about the shower, or at my work desk? Even better would be Bluetooth speakers with playback controls including pause. I attend conferences. A lot of conferences. Battery life is always a concern at such events, where cell signal is frequently poor, and a bunch of photos, videos, and tweets are made. This all affects battery life. I'd rather not stay in sluggish battery saver mode all day, and would prefer to be ready in advance with a charging case that easily fits into my pocket. Below, you'll find that most of the devices have succeeded meeting these needs for a while now, and each product has a story. I've also put together some unboxing videos too. 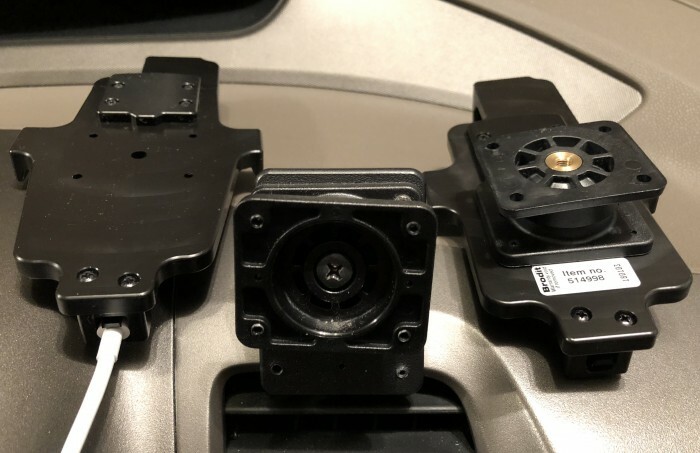 I hope this information helps others, knowing full well what a hard time I had finding devices that would fit these needs, and what a pleasure it is when you finally find solutions that fit the bill, and the need. Amazon, in Blue, Green, Purple, or Silver. I've had mine since July 2017, first available on Amazon Feb 2015. It works well, is loud enough, and seems completely unaffected by moisture. Great for podcasts, sufficient for music or FM radio. Happy with this purchase, and still haven't seen anything else quite like it, even at local malls, Best Buy, The Microsoft Store, or The Apple Store. Seems good enough for occasional use, does provide me roughly one full iPhone X charge when on the go for an entire day without a power source. 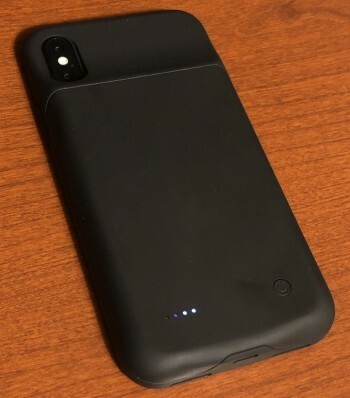 Much more convenient than carrying a separate battery in your pocket, even the newer Qi types such as this Mophie Powerstation Wireless External Battery Charger for Qi Enabled Smartphones. My particular Peyou iPhone Charging Case has died. Suddenly during a recent trip, after working just fine at the beginning of the trip, it decided to stay on one blinking green LED forever, no matter what cable or charger I use it with. It's now getting recycled. This is just one failure, your results may vary. Amazon currently now show 3 stars / 37 reviews. Amazon, in Black and Silver. "8 AM Fast Wireless Charger with Bluetooth Speaker unboxing and testing [4K]" on TinkerTry's YouTube Channel. Read more about it at TinkerTry here. works nearly perfectly for my needs! 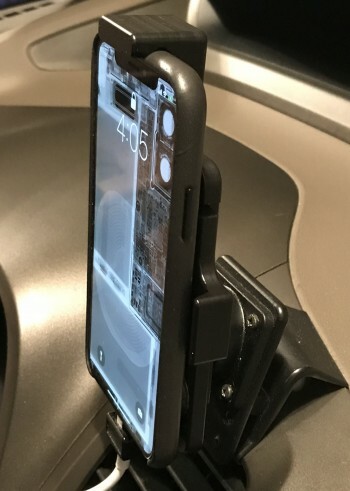 Sturdy ProClip USA dashboard mounts for iPhone 6/7/8 Plus or iPhone X allow one handed dock-and-go. Easy to slide right in, but I had to remove my leather case first, of course. This shows my iPhone 7 Plus cradle at left, and my new iPhone X cradle at right. I simplly moved the plastic block with the white cable out of it, and plan to paint the white cable black. Easy! All this old stuff came off my desk, once I began to use my Bluetooth speaker/Qi charger. As soon as I turn on my power strip for my monitors and the Bluetooth speaker/Qi charger, the podcast that was playing in my pocket suddenly just starts playing on the much better speaker. Nice! When I turn the monitors/speaker off when leaving my office, whatever was playing pauses, then a few seconds later I just tap on my iPhone or Apple watch, to resume podcast playback. 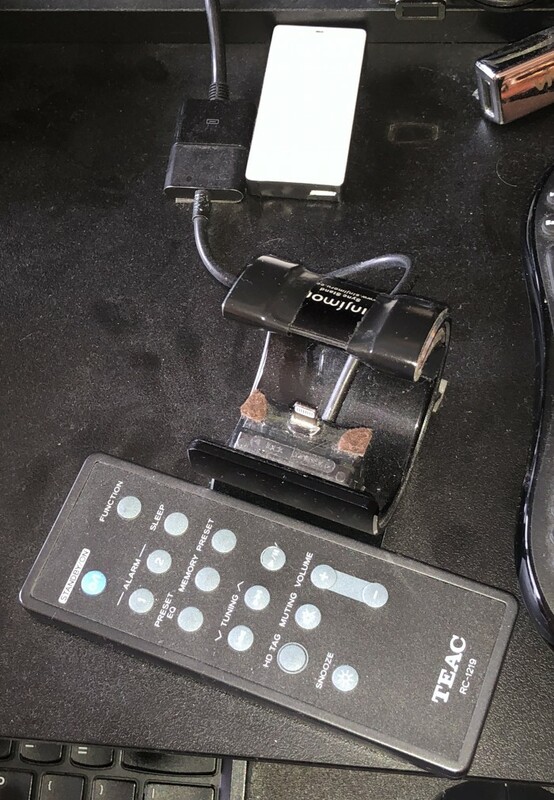 Some of the dust collectors I was able to get rid of, including this awful looking Lightning iPhone docking contraption. Added the Satechi Bluetooth Button to the article above. 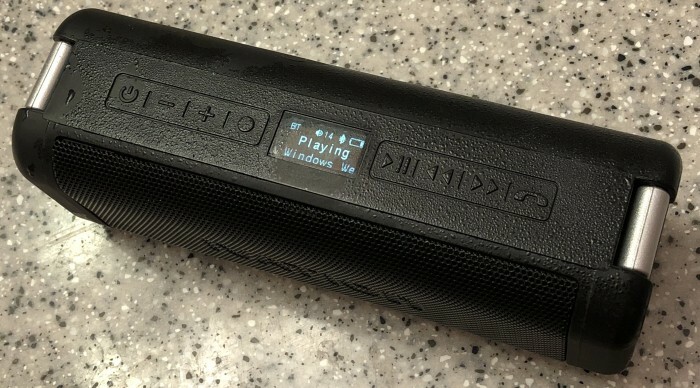 The day I was preparing this article, Amazon showed availability for the Ivation Portable Waterproof Bluetooth Speaker. But the day I finally published this article, both Amazon and Newegg show no stock, with only Ritz Camera showing availability. I'm so very sorry I didn't get this article published earlier, and I'm disappointed this speaker has apparently been pulled from the market so soon. 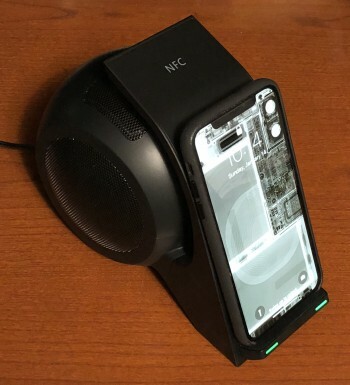 Also, as for the "8 AM" branded bluetooth speaker featuring Qi wireless charging, it seems searches of Amazon reveal that there are many clones of this design with presumably identical functionality, sold under a variety of relatively unknown brands, including CENSHI, YONGXING, and Hestio. 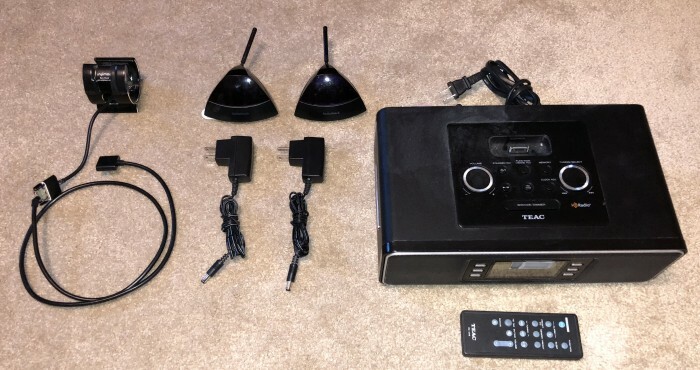 Back in December of 2017, I had tried the Azpen DockAll D100 Qi Wireless Charging Sound Hub with Subwoofer from Sam's Club, but wound up returning it. 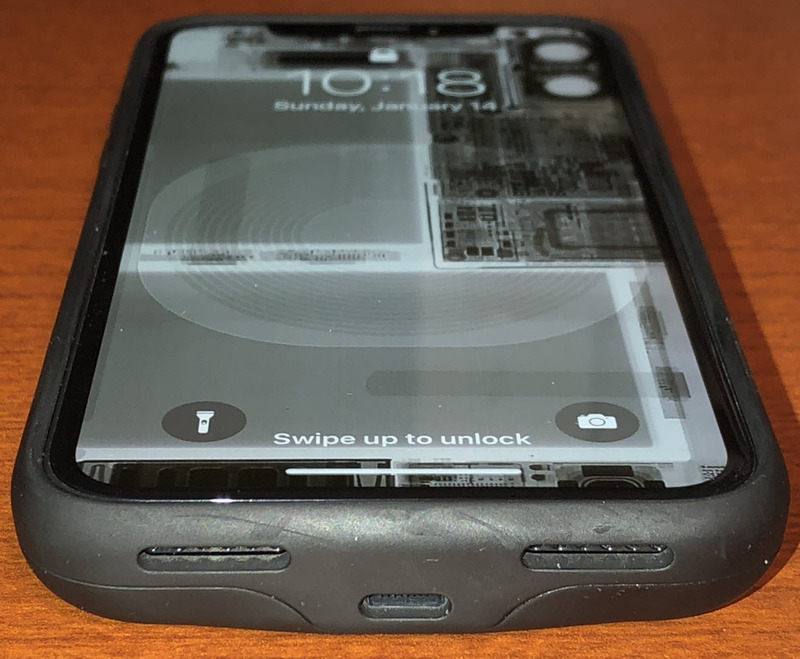 While the sound was good and it had deeper bass, it also had touch controls were too sluggish to always get right on the first tap, volume adjustments required many taps on +/- instead of just push-and-hold, and my iPhone's Bluetooth wouldn't auto-reconnect to it when it was plugged in. This greatly reduced its usefulness for me. Featured on "Home Gadget Geeks" Episode #340 "Paul Braren and Vintage Tech, 70s thru 90s Head Phones, Cell Phones, Camcorders and Video Games – HGG340"
In this podcast, you'll also hear about the audio tech that I'm using now, including the Bose Quiet Comfort 35 (Series I) and Audio-Technica AT2005USB Cardioid Dynamic USB/XLR Microphone, it's all detailed at this spot.